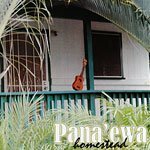 Fallen is by Pana’ewa, one of the few local bands to feature the ‘ukulele prominently. As beautiful as the playing is, I’m not sure who laid the uke track. (Finding info on Hawaiian bands is next to impossible!) Regardless, the picking part that repeats throughout Fallen makes makes the song tick and the outro solo is one of the most tasteful pieces of uke picking you’ll hear.